Interviews with the cast and filmmakers of Breakthrough (2019), Teen Spirit (2018), Fast Color (2018) and Someone Great (2019). 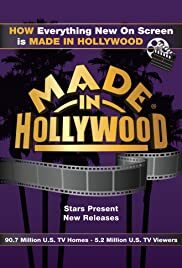 "MADE IN HOLLYWOOD", is an inventive behind-the-screen entertainment news, headline; magazine-styled series, featuring exclusive celebrity interviews with Hollywood's premiere talent. There is on-set coverage with directors, writers & producers, and previews of upcoming motion picture and DVD releases. "MADE IN HOLLYWOOD" also gives the viewer a look at how special effects artists, and their tech wizards, pull off the complex magic needed to bring many of the years biggest blockbusters to life.